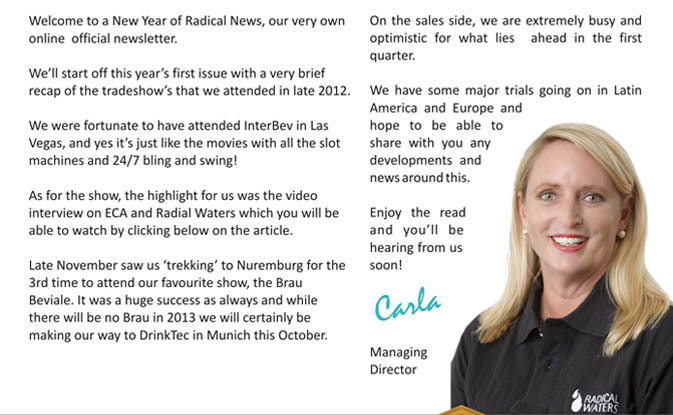 Radical News October 2012 – February 2013 Newsletter. 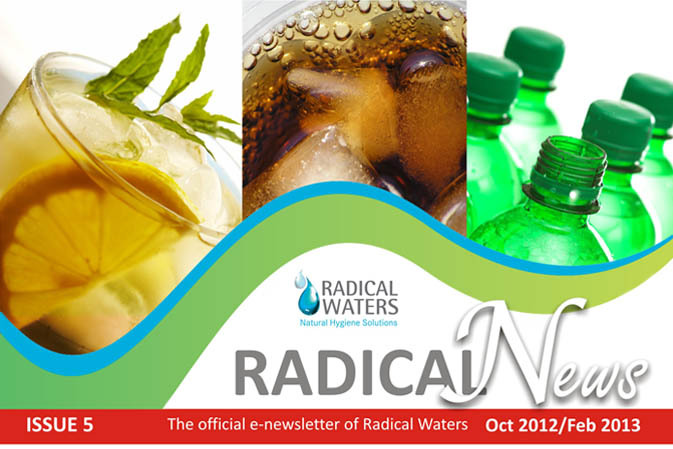 Radical Waters is the global leader in Electro-Chemically Activated Water (ECA) technology. 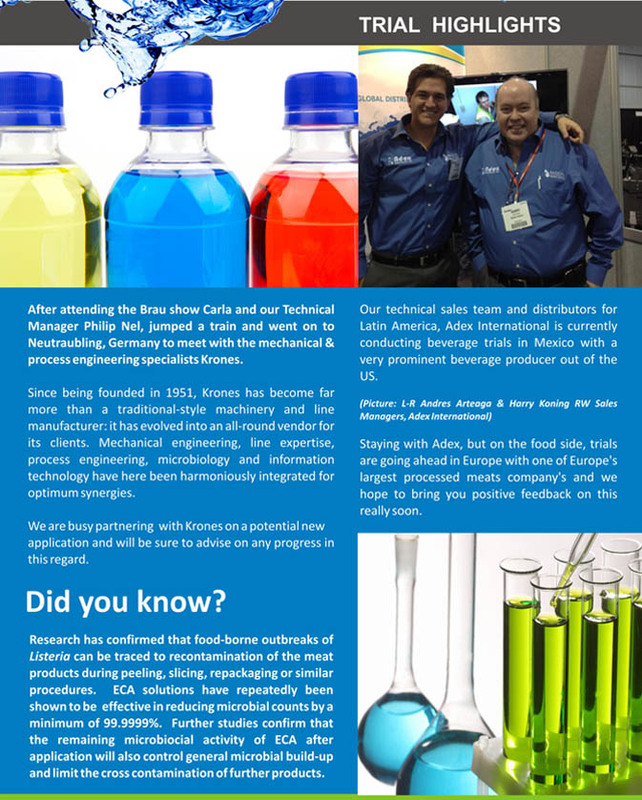 Our ECA products are used in a wide range of markets formerly dependent on chemicals for controlling contamination and bacterial infection. We manufacture Natural Hygiene Generators. Our generators come in several sizes and produce, hygiene solutions that replace traditional chemicals. Our Natural Hygiene Solutions, generically known as Anolyte and Catholyte, are produced through a process known as electrochemical activation of water, or ECA. Radical Waters’ ECA focuses on markets that include beverage production, meat & seafood, sauce manufacture, milling & starch and hospitality. 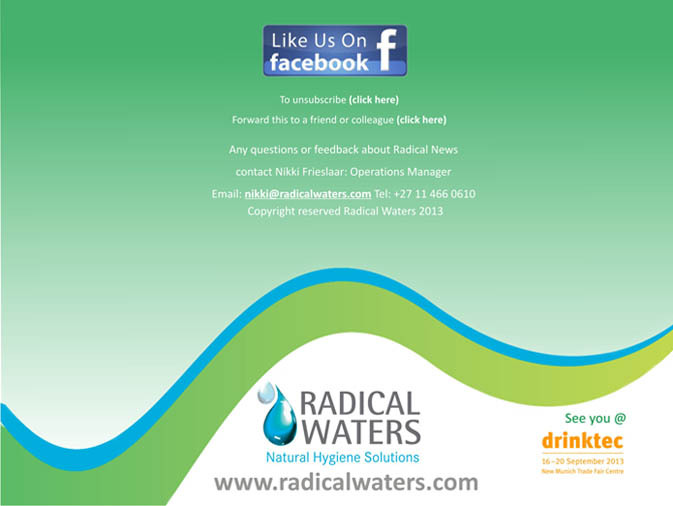 The outlook for the Radical Waters Group is extremely positive, with numerous applications for the use of ECA technology thanks to the fact that it is safe for use on food and in all food environments; nontoxic; safe for the treatment of water used in food and beverage plants; produced on site on demand; free-rinsing (no post-application rinsing is required); and is residue and taint free. Radical Waters (Pty) Ltd has spent over 20 years focused on developing and commercializing its patented green ECA technology. 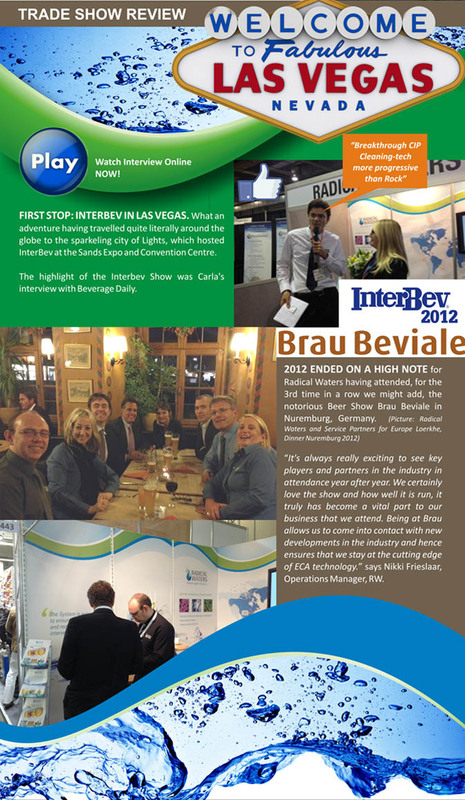 The company has installed operating ECA devices on 6 continents and in 27 countries primarily for blue chip companies. Our products are used in a wide range of markets formerly dependent on chemicals for controlling contamination and bacterial infection. Radical Waters’ ECA focuses on Global markets that include beverage production, meat & seafood, sauce manufacture, milling & starch and hospitality.